You can not get milk, vegetables and goods for ten days from the date of June 1. The townspeople are going to see how all the people who are riddled with rice will be angry. Rashtriya Kisan Mahasang, with 110 farmers across the country,they decided to take this decision. It is clear that they will not supply milk, vegetables and other goods to cities across the country for ten days from June 1. The decision was taken in protest against the anti-farmer policies adopted by the central government. Bharat bandh is held till 2 o'clock in the afternoon of June. Among those who declared the matter were Rashtriya Kisan Mahasang leaders along with BJP former Yashwant Sinha. He said the cooperative non-cooperation movement would be on June 6. Though the government has announced that it will decide 50 per cent higher minimum support price for farmers, the farmers have not been able to pay the price. Sivakumar kakka, a farmer of Madhya Pradesh, said that the government has to pay a minimum liability of 50 per cent more than the cost of production. It is not just the cost of fertilizer, pesticide and other crops, even when calculating the cost of production. Interest on farmers' housing, agricultural land taxes and the cost of purchasing own land are the main demands of the farmer community. 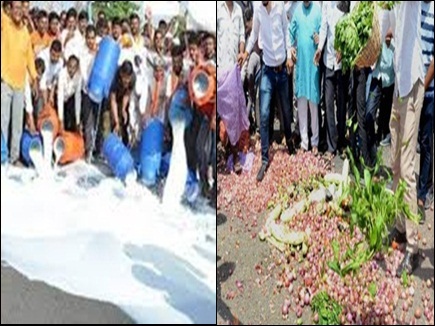 Last month, Yashwant Sinha praised the long March of farmers in Maharashtra. The government blamed the government for making false assurances. He said that the Prime Minister's promises and slogans remained all a while and the farmers did not help anyway. The BJP manifesto said that the promises had not been fulfilled. The farmers also urged the corporates to cooperate with Bharat bandh on June 10.